A few weeks ago, while trying to figure out what the have for dinner, my restaurant advisor had sent a few recommendations. 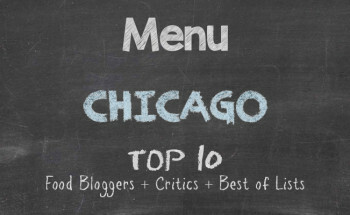 One recommendation was a restaurant that serves the best seafood boils in Chicago. The other was a vegetarian forward restaurant. Since my restaurant advisor was curtailing certain culinary items for Lent, I went with the vegetarian options. So, our landing spot was Bad Hunter at 802 W. Randolph Street. Going back to an approach in ordering that has worked well for us in the past, we rattled off a few ideas to our server and let her surprise us. 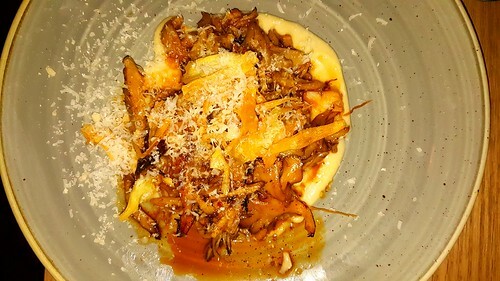 The first plate that we shared was of maitake mushrooms with parsnips, smoked pecans, parmesan, and lavendar. Perfect for sharing, but tasty to the point where it could introduce a bit of selfishness because every bite is a dream. The one meat dish we had was of two rather large shrimp with the heads on. 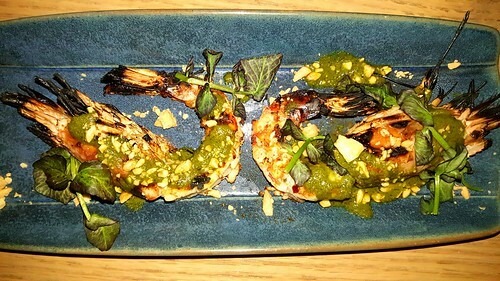 The shrimp had been wood grilled and were plump to the bite. Having a little bit of the parmesan from the maitake mushrooms, we also ran morsels of the shrimp through the sauce, which made for a great accent to the shrimp that didn’t take away from the freshness of the dish. 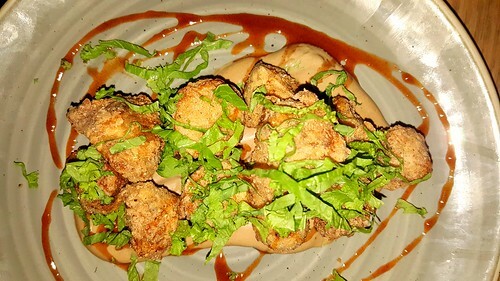 The third dish of fried sunchokes was a delectable plus. Fried in a light buttermilk and black garlic batter, and drizzled with aleppo chili honey, these Jeruselem artichokes reminded me of a marriage between turnips without the bitter bite and cubed potatoes. In the same manner of being a plate to share, it took was splendid without being filling. 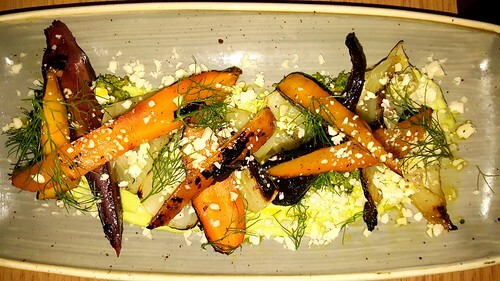 For our fourth course, we continued in the light dish spectrum with a plate of wood grilled carrots and fennel with pistachio-green chili pesto, avocado cream, and queso fresco. Usually I have dishes where fennel is somewhat like a hint thrown in for effect. Having a substantial amount of fennel in this dish made me love it that much more. And having it balanced out with the carrots made this dish one I would return to indulge often. The final large course was a plate of fry bread. Stuffed very lightly with dill and served with pickled onions, burrata, and chili oil, this would have been a very good start to the meal. Then again, it would be a perfect snack throughout the day and with dinner and when you can’t figure out what to eat and just because. Extremely soft to each bite, the burrata spread made it that more inviting. The finale was an exotic dessert. 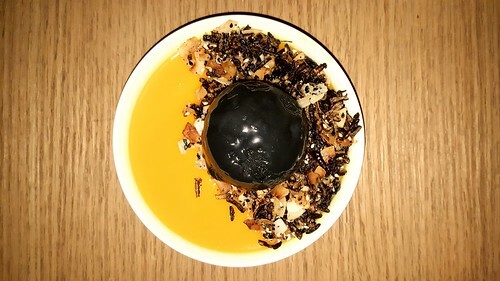 We had turmeric panna cotta topped with passion fruit, puffed rice, and coconut ash ice cream. Panna cotta is alreay my favourite Italian dessert, but adding turmeric to it livened the flavour without introducing the herbal taste of turmeric. The coconut ash ice cream was not only refreshing but it was also captivating because it was jet black. The combination of all of the ingredients played well without turning the dessert into something busy on the palate. My favourite pure vegetarian restaurant is Green Zebra in Chicago’s Noble Square area. Bad Hunter ranks highly on my favourite list, although there are a few menu items that indulge meat offerings. The service was an absolute highlight, from the server being conversational to being extremely knowledgeable of all menu items to making recommendations. For a spacious dining area, seating is very close and the restaurant fills up. 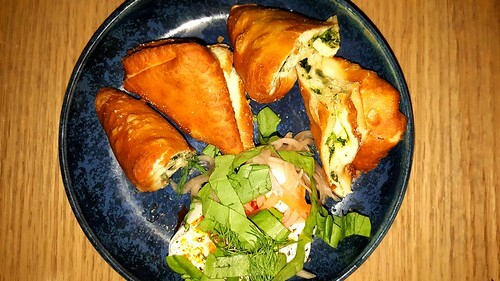 In the midst of numerous other meat-centric restaurants, vegetarian forward Bad Hunter is a very good option.